When was the last time you felt God nudge you out of your comfort zone? How’d you respond? Speaking as a plotter, planner, safety-lover, it can be sooooooo hard to step out into the unknown or challenging, but it’s when we do that God opens our eyes and blesses our hearts abundantly. This is when we discover and grab hold of the abundant life Jesus promises. Today’s incredibly beautiful post by Carrie Schmidt inspired and challenged me to a deeper level of surrender and love. They say that life begins at the end of your comfort zone. This has certainly been true for my life. Pre-comfort-zone-obliteration, I was uncomfortable with discomfort. I avoided activities that could cause awkwardness. I stayed as far away as possible from hospitals or poverty or people who believed differently than me. Absolutely, under no circumstances, did I share my Jesus with those people of different belief unless forced, and then it rarely ended well. Pre-comfort-zone-obliteration, I liked my day to proceed according to plan. Anything – or anyone – that dared to intrude on my carefully guarded schedule was looked upon with great frustration, as an inconvenience of the highest sort. Are you getting a good picture of my “safely-ensconced-in-my-comfort-zone” life? Awkward. Nervous. Kinda prickly. Selfish for sure. Picky, picky eater. Often paralyzed by fear. A loner. Miserable. And then 2003 arrived. The beginning of the end of my comfort zone. IEDs and other deadly missiles. If you’ll also recall, December 2003 marked the capture of Saddam Hussein in Iraq. Yeah. My brother was within a few miles of his hideout. I was, in a word, terrified, and God and I began the process of breaking some long-held chains of fear during those weeks that Josh was in Iraq. 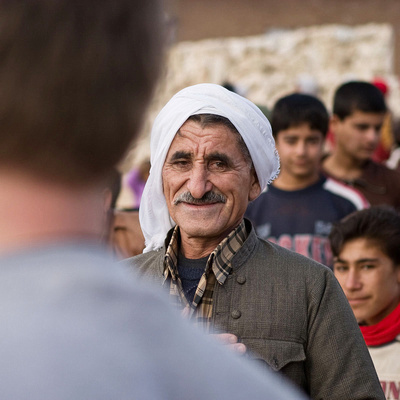 And then Josh came back with this treasure trove of images (he was the team photographer; you can see his photos at http://www.joshboothphoto.com/iraq), of faces that gazed back at me and captured my heart. I could not get them out of my system. I didn’t want to get them out of my system. So when a friend asked me almost a year later if I would be interested in teaching at a local church’s English as a Second Language ministry, I thought about it for maybe a half-second before jumping at the chance. Y’all. It’s been 10 years and I haven’t once looked back. That comfort zone? Completely GONE. My life? Completely BLESSED. I had no idea when I started teaching ESL that I would experience even a tenth of the memories I now cherish close to my heart. My involvement isn’t limited to the hours I teach in the classroom – it extends to lunch invitations, doctor appointments, hospital visits, mail interpretation, errands, tutoring, homework help for the kids, etc. And while I’ve lost count of how many students I’ve taught over the last ten years (our program averages about 100 students spread across several different level-specfic classes), their faces and friendships are etched on my heart forever. Like Olga, my 70-something-year-old Peruvian student, who absolutely delighted me every single second I was in her presence. She and her husband became some of my dearest friends, and I had the honor of attending each of their naturalization ceremonies when they became US citizens. Olga is with Jesus now, and I still miss her. But I smile at her memory every single time I log on to social media because my “handle” is in her honor. She always, always always called me “Miss Carrie,” no matter how many times I told her that I didn’t need the term of respect from her. In her precious accent, it sounded more like “Meez Carrie,” and thus my social media identity was born. Or like my Ukrainian bestie (also in her seventies) and my Iranian brother (another seventy-year-old) who text me on a regular basis just to say hi. My precious Lucy from Ukraine calls me “my heart” and we frequently get into trouble together with a myriad of shenanigans. My Iranian brother never forgets a birthday or a holiday, and his face lights up with the Joy that now lives inside him. Or like my dear Muslim girlfriends, who open up their homes and their hearts and their lives to me on a regular basis. We laugh with each other. We cry for each other. They’ve been to my family’s funerals. I’ve been to theirs. We actually have a lot in common, but our differences have led to some really meaningful discussions about Jesus. Which have, in turn, made me love Jesus – and my Muslim friends – even more. Or like my sweet Chinese friend who had just had a baby and was trying to figure out how to work her pump. I, having had no children, was not terribly helpful but I could at least attempt the directions. We laughed a lot that day. Laughter and love transcend language barriers, and Jesus works through both in crazy awesome ways. Do you remember my life inside my comfort zone? Awkward. Nervous. Kinda prickly. Selfish for sure. Picky, picky eater. Often paralyzed by fear. A loner. Miserable. Life after my comfort zone? Thanks to Jesus and my internationals … laughter. So much laughter. JOY. Grace. LOVE overflowing. Still working on the selfish thing but it’s not my go-to response anymore, at least. Completely different food experiences (that’s for another blog post, lol!). Fear no longer enslaves me. Extroverted introvert. Head over heels in love with Jesus and how He changes lives. Carrie Schmidt (aka MeezCarrie) is an avid reader, a book reviewer, a story addict, a KissingBooks fan and a book boyfriend collector. She also loves Jesus and THE Story a whole lot. Her passion in blogging/reviewing is to connect readers with a new favorite author or book, especially in the Christian fiction genre. Carrie lives in central Kentucky with her hubby Eric and their quirky dog Zuzu and is the long distance cool aunt to nine nieces and nephews. When she’s not reading or reviewing or “cool-aunting”, Carrie teaches English as a Second/Other Language to international adults. Learn more about Carrie at http://readingismysuperpower.org. Let’s talk about this: Carrie spoke about being moved beyond her comfort zone and what God has taught her through that move. How has He moved you out of your comfort zone? What did you experience when you were out of your comfort zone? How did it change your life? Share your thoughts in the comments below. If God used Carrie’s post to nudge you a bit this morning, I encourage you to listen to a powerful sermon my pastor gave last Sunday. Then find your have to. Your life will never be the same, promise. When Hearts Break, Everyone Wins. Before you go, if you’re in the Omaha-Metro area, I would love for you to stop by my book signing today at Divine Truth Christian Bookstore in La Vista! And if you’re within driving distance, I do hope you’ll join me at the Wordsowers Conference next weekend (April 29th and 30th) where I’ll be teaching how one can craft characters that grab hold of readers on a deeply emotional level.